This is a photo of one of our backyard squirrels that terrorize our birdfeeders. I stopped that by installing a slinky on the pole. I would suggest that you crop below elbows equal amount that is above the head. Since you do not show all the legs.. a higher crop is IMO better... below that shows nothing that contributes to your story. You really need to get a video of them trying. That has got to be hilarious. Thank you for sharing your comments. I will take all of this into consideration. 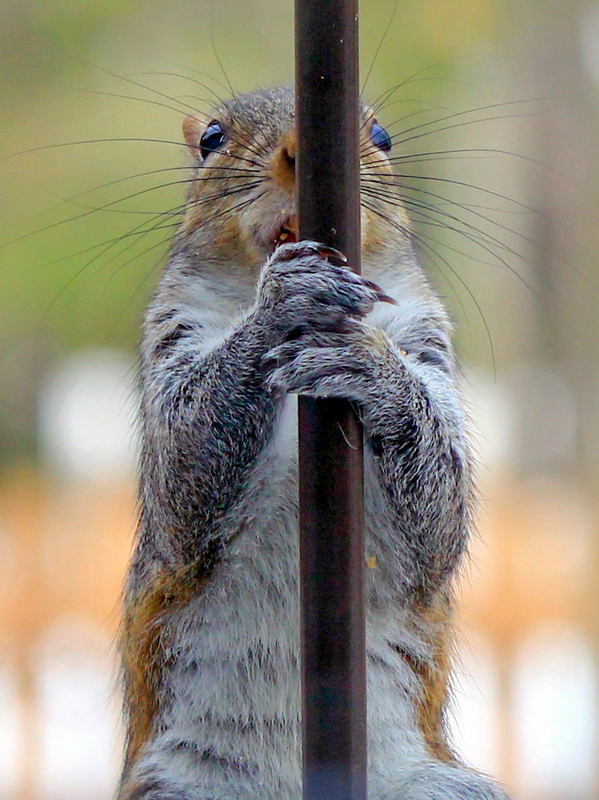 Oh Great Close-up of Sqeaky up a pole....they are soooo Squirrely and a lot of fun to watch. Cue the Barry White tunes!!! LOL! The squirrel slinky interaction sounds like good fun, will have to try that!! Nice shot.